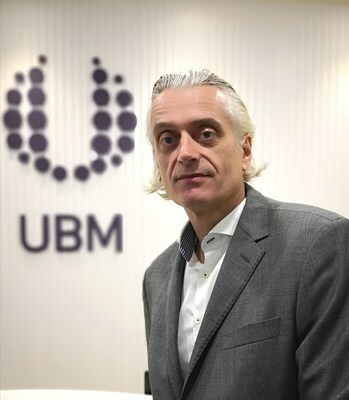 KUALA LUMPUR, Malaysia, Jan. 25, 2019 /PRNewswire/ -- UBM Malaysia announces the appointment of Mr Gerard Leeuwenburgh as the Country General Manager effective 2nd January 2019. Gerard is responsible for providing the overall leadership to deliver on their ambition of accelerated growth in Malaysia. In this role, Gerard reports to Mr Ian Roberts, Regional Executive Director of ASEAN. Gerard has been in the MICE industry for over 25 years and has worked for Jaarbeurs, VNU Exhibitions in various leadership roles. Prior to joining UBM, he was attached with DMG events as Vice President Asia, responsible for managing and growing the energy portfolio in Asia. Gerard has worked in Europe and other countries in Asia including Thailand and Singapore. UBM Asia Group Managing Director of ASEAN Business Mr M Gandhi said, "We are very excited to have Gerard on board. I am confident that he will be an excellent addition to the ASEAN management team and able to share his wealth of experience and provide the necessary leadership to further build our business." UBM Malaysia is a subsidiary of UBM Asia which recently became part of Informa PLC, a leading B2B information services group and the largest B2B event organiser in the world. With a growing portfolio of 30 trade events in Malaysia and Southeast Asia, UBM Malaysia creates business growth opportunities for ASEAN and the rest of the world in a wide range of industries including Furniture & Interiors, Industrial Machinery, Renewable Energy, Power, Security, Construction, Food, Oil & Gas, Hospitality, Livestock, Beauty, Water & Wastewater Subcontracting, Environmental Technology and HVAC. Gerard succeeds Mr Alun Jones who will leave the organisation by 31st January 2019. For more information about UBM Malaysia, visit www.ubm.com/malaysia. UBM Malaysia is a member of UBM Asia recently became part of Informa PLC, a leading B2B information services group and the largest B2B Events organiser in the world. UBM in Malaysia creates business growth opportunities for ASEAN and the rest of the world in a wide range of industries including Furniture & Interiors, Industrial Machinery, Renewable Energy, Power, Security, Construction, Food, Oil & Gas, Hospitality, Livestock, Beauty, Water & Wastewater Subcontracting, Environmental Technology and HVAC. For more information, visit www.ubm.com/malaysia.